I arrived in Pakse on Monday, June the 11th, after an overnight stop in Thakhek, the midpoint between Vientiane and my land. My new Hyundai truck performed beautifully and was slightly less expensive to drive than the now-gone Chinese SUV. I was only stopped and fined for speeding once, which is more of a tax than a fine, really, because it’s impossible to go 30km an hour through villages; I’d surely be rear-ended by a bus or a truck or chased down by dogs. This is the area that needs to be leveled. 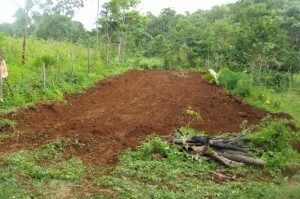 The main goal of this trip was to get the area for my aquaponics project, my greenhouse, leveled. There were secondary goals, thankfully. Leveling requires a tractor, and they come in a variety of sizes and colors, the most common being the bright orange Kubota. These Kubota tractors were a mystery to me. Their existence, in practical terms, seemed to be more of a legend than reality. When they are not plowing fields in the lowlands for tapioca or other such production, they are rumored to roam about aimlessly over the pot-holed highways of Laos, waiting to be waived down for some sort of tractor-specific job, such as mine. Thus it was that on the first day word was let out that if a bright orange Kubota tractor threatened to pass by, it was to be waved down and instructed to head to my land. My imagination, being what it is, was spitting up vivid images of dark-tanned Asian guys wearing cowboy hats as they drove their tractors at high speeds, shiny silk scarves around their necks flapping in the wind. 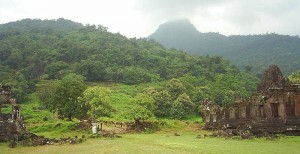 Ray's village on the Mekong is a gateway of sorts to the ruins of Wat Phu, a World Heritage Site. Having arrived in Pakse in the early afternoon on Monday, we proceeded a bit further south to check out the Cousin from Pakse, who appears to have a name familiar to me, that of Ray. Ray would be very useful if he ever ran out of things to talk about and got down to working. He’s family, though, and as such there is supposed to be some kind of mutual cooperative thing between us. I suspect this involves our being excessively generous and his being mildly grateful. For all his talking, we knew very little about Ray’s home life. A guy like him needs a serious, down-to-earth wife, and luckily this was the case. I was also happy to see that his home is close the the Mekong River at the ferry crossing to the small town of Champasak. It’s where minivans drop off tourists for the trip across the river and on to the temple ruins of Wat Phu, a World Heritage Site. Overgrown or "lush?" 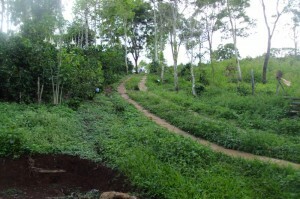 It's still a very nice access slope. Over a few hours and a case of beer we got to know Ray’s family. I also started getting things organized. Ray’s friend has a six-wheel dump truck and the plan was, at that time, to get one load of dirt so that Ray and Billy, my landlord, could finish filling between the concrete strips of my strip road. They’ve already been paid for that. 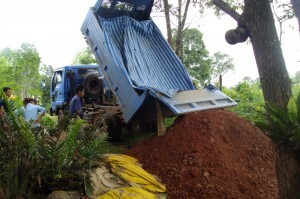 Dirt is cheap in the Pakse area but unfortunately it needs to be transported about 45km to my site. The dirt around my area is volcanic, which is nice, but it’s also full of rocks. After one load of dirt deposited at the top of the access slope, the driver, Ray’s friend, would determine if he was brave enough to deliver 4 or 5 more loads to the bottom of the access slope where my greenhouse will be. I thought, at the time, that it would be easier to fill in the lower portions than to knock down the higher portions. I don’t have a knack for these things. . . It's hard to get excited about a load of dirt, but progress is progress. The next morning Ray and his daughter hitched a ride on the six-wheeler. The driver dumped his load but chickened out when it came to bringing more loads down the slope. It wasn’t going down that he was afraid of. It’s been raining a lot and he was afraid he’d get stuck down at the bottom. Fair enough. I was afraid to go down in my Hyundai for the very same reason. Everyone assured me that the legendary Kubota tractor would make short work of the leveling job. I looked over my shoulder but I didn’t see a Kubota tractor coming around the corner. Bringing grid power to the land. A few days went whizzing past, as they do, but the Kubota guys must have gone elsewhere. Luckily, there were some other things on the agenda. 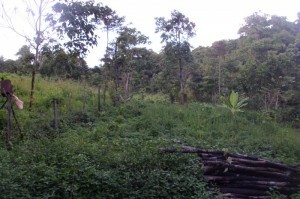 Ray gave a sizable portion of my land a much needed haircut. Then I had them bring me in grid power from Billy’s house on the road. 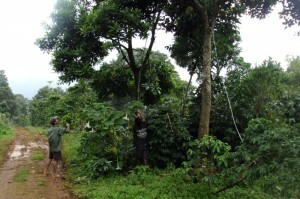 This required a lot of expensive electrical cable strung from tree to tree. By early Thursday afternoon it was all up and sorted. By now money was in short supply and there wasn’t really anything for Ray to do. I looked over my shoulder one more time but no bright orange Kubota tractor was racing in my direction to save the day. So, I retired to my guest house, shaved for the first time in weeks, and went across the road to sulk over a cold Beer Lao, resigned to going back to Vientiane without getting the leveling done. At last the legendary tractor came and did its job. It was then that I got a call from the land. I learned later that Billy had been on his way to the market on his dilapidated motorbike to get vegetables for his pigs when two legendary Kubota tractors went racing by him in the other direction. 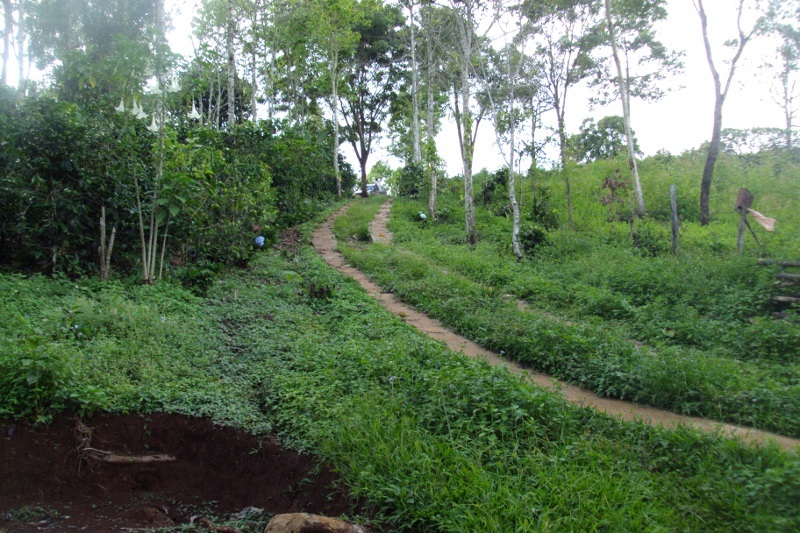 He turned around and chased them for about 15km in the downhill direction of Pakse. By the time I got to the land, one tractor was parked at the entrance to the land by the main road and another was parked at the top of the access road. That one had done the work. Finished. I’d missed all the action. The driver, who didn’t look anything like the Asian version of Clint Eastwood that I’d imagined, was merely waiting for my approval so that he could get paid and go. The damage was 500,000 kip, or $60. I was immensely satisfied. Sure, it’s not as wide as I’d hoped (they said they hit stubborn rocks at this level and couldn’t bring any more to the right, down slope). It’s a good 30m long, though, which will give me room for expansion. The width, at only 6 or so meters, has forced me to make some design changes, good ones, which is how I kept my mind active on the 750km journey back to Vientiane. Richard, looks like you’re getting things done! Down the road in Champassak where the crossing takes place is certainly a nice place… has it changed a lot since 2008 (my last visit)? With the ground levelled looks like you’ll be building your fish tanks and grow beds pretty soon!